Michelangelo guides Leonardo up a staircase and to the roof of a building. Mikey is babying Leo because he’s blind, which Leo resents. Leo apologizes to Mikey for snapping at him; he’s having a rough night as Donatello just told him the tests on his eyesight restoration don’t look very hopeful. Breathing in the night air, he asks Mikey if he’s expended any thought on what their lives would be like if they gave up being warriors. Mikey tells Leo not to lose hope and dodges the conversation. Leo asks to be left alone and as soon as Mikey leaves, he feels his way to a radio tower and climbs to the top. Once there, he draws his swords and lets out a scream of anguish and frustration. Just then, one of the struts he’s standing on breaks. Leo falls from the tower all the way to the sidewalk below, landing on his own sword and impaling himself. Pedestrians gather around his corpse, confused and frightened at what the “creature” might be. The police quickly take charge and cover up the body. The Sergeant fends off the press until the detectives arrive. They’re all very concerned about where the corpse came from. Forensics find his swords and reconstruct that the creature fell from the tower. 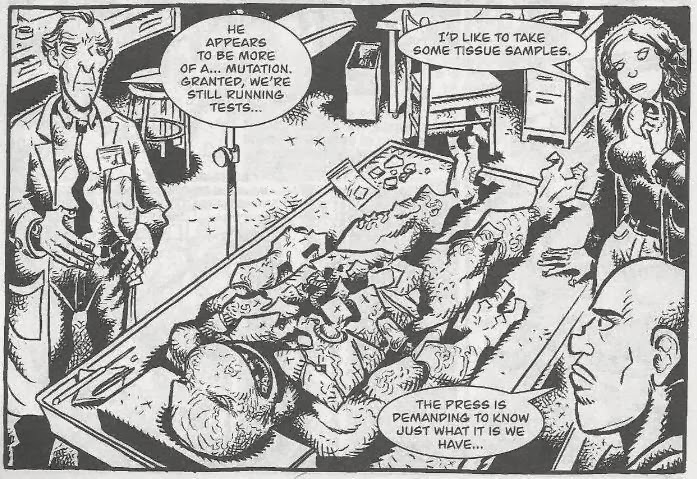 At the morgue, the detective, the coroner and a cryptozoologist convene on the nature of the dead body. The crytozoologist suggests that the creature was intelligent, judging by the clothes he was wearing and the craftsmanship of his sword. The coroner tells them that they lifted prints from the body’s carapace and plastron, and they were similar in shape to the prints of the corpse, suggesting that there of more of the creatures in the city. They also collected a sample of dirt from the creature’s feet and traced its origin down to the sewers below Manhattan. A short while later, a SWAT team begins scouring the sewers. They find several of Donatello’s alarms and traps, and carefully deactivate them. The traps and eventually lead them to the sewer lair. They take Splinter, Mikey, Don and Raph by surprise, holding them at gunpoint and telling the mutants not to move. 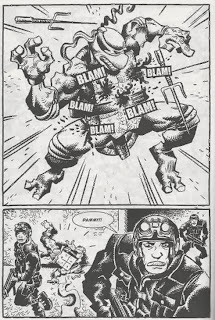 Raph attacks and is shot dead. The other Turtles and Splinter give up without a fight. As he lay dying, Raph mumbles that none of this would have happened if Leo had been there. Up on the radio tower, Leo awakens from his vision. Sullenly, he drops his swords and lets them fall to the roof. *This story is continued from Tales of the TMNT (Vol. 2) #5. The story continues in Tales of Leonardo: Blind Sight #2. “It was all a dream!” Well, yeah, I mean, of course it was. But still. Grrr. 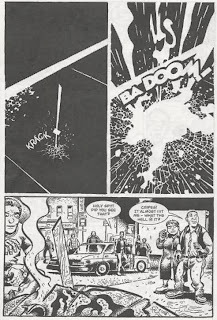 I’m of the opinion that “Blind Faith” was a great standalone tale that really, really didn’t need a follow up. Some stories are just better off left alone; sequels only undermine the strength of the original. Tales of the TMNT (Vol. 1) #4 was a perfect oneshot; we didn’t need a prequel in the form of Tales of the TMNT (Vol. 2) #35 to rob it of its eerie mystique. TMNT (Vol. 1) #16 was a wonderful bit of done-in-one cartooning; TMNT (Vol. 1) #22 and TMNT (Vol. 1) #23 just drag a completed story out into tedium. TMNT (Vol. 1) #28 is somber and heart-wrenching; TMNT (Vol. 2) #4 and TMNT (Vol. 2) #5 just completely undercut the message. I know it isn’t always easy, but sometimes a creator needs to fight the urge and just leave well enough alone. No, “Blind Faith” didn’t restore Leo’s sight at the end, but one could easily write it off as only being a temporary ailment or what have you. While the “Blind Sight” mini explains how Leo got his vision back, it does so at the expense of the original tale; pulling the rug out from under it. But more on that situation as it progresses. This opening chapter is “all a dream”, as Leo ponders what would happen to his family if he died. 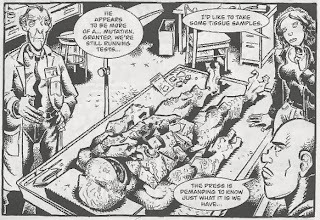 The way the media and police handle the sudden discovery of a dead mutant in the streets of Manhattan is admittedly rather interesting; the way they managed to come to several conclusions about Leo based on forensic evidence, in particular. So I liked all that stuff. Yeah, “it was just a dream”, but c’mon. The moment Leo died and the Turtles were exposed to the world, I think we all knew there was only one way this story could have ended. Besides, “it was all a dream” stories aren’t inherently bad. That Batman the Animated Series episode, “Over the Edge” was great, copout ending and all. The 4Kids TMNT series did it, too, with the episode "Bad Day" (don't remember that one well-enough to recall if it was any good, though). The execution in Leonardo’s vision, however, was a bit problematic. Firstly, he dies in a very stupid and random way. The vision was supposed to be about Leo “giving up” and “abandoning” his family, so you’d think he’d have committed suicide. But nah, he basically slips on a banana peel and kills himself. The point of such a silly death, at least as I interpreted it, was to show how Leo considers himself to be a liability now that he’s blind. I think a suicide would have been a better fit since Raph’s final words were in regards to Leo not being around to help them, not being a deadweight screw-up. If we do get any insight into Leo’s character, it’s that he seems awfully freakin’ arrogant; the idea that if he’s not around to protect his family, they’ll all die or get captured. You know, like they’re all useless without him or something. Don leaving a trail of obvious booby-traps right to their front door, Raph leaping directly into a hail of gunfire like a moron, Mike and Splinter surrendering without any resistance… he sure doesn’t seem to think much of his family (or at least their competence to do anything without his guidance). 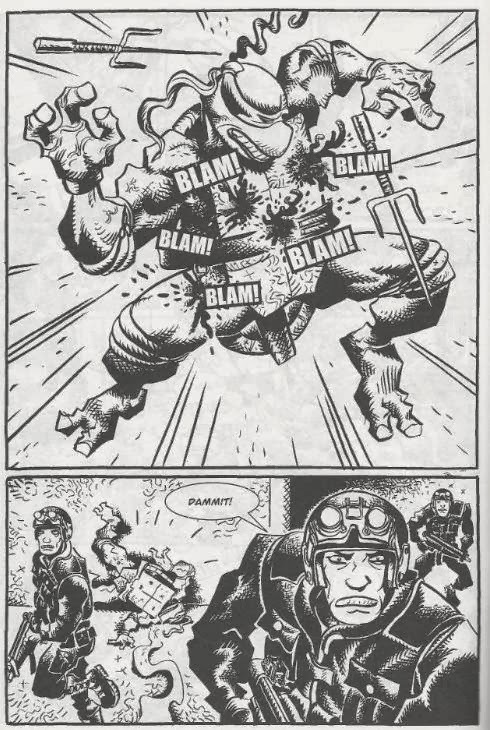 In a way, this feels like Lawson doing a bit of a follow-up to Leo’s neutered story arc from TMNT Volume 2. At the start of that volume, with his family splitting up and going their separate ways, Leo was left to face the reality that he’s spent all his life building himself up to be the perfect leader… and now he has no team to lead. Leo’s brief talk with Mike in this issue about what they would do if they stopped being warriors hits on the subject for a moment, but the discussion is sidelined and we’re led into Leo’s dream sequence. And it seems like he got the wrong message completely, doesn't it? Instead of wondering what his life would be like if he didn’t have a team to lead, he wonders what his team would be like if they didn’t have him to lead them. Again, Leo has a pretty inflated opinion of himself, doesn’t he? 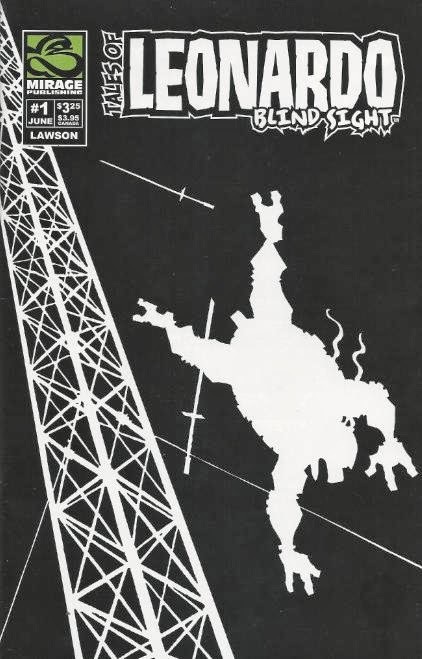 Artistically, I liked how Lawson transitioned from his silhouette style into his normal detailed style between the real world and the dream sequence. 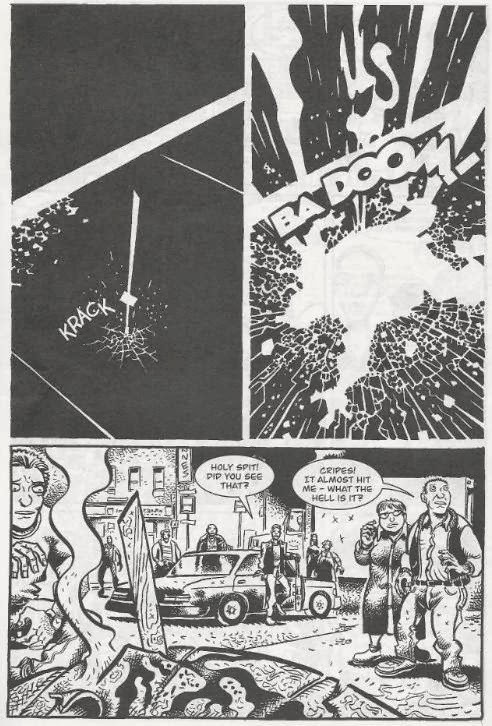 I liked the silhouette gimmick in “Blind Faith”, but I don’t think I’d be able to put up with it for four straight issues. Anyhow, despite my opinion that “Blind Sight” was an unnecessary continuation of a great oneshot, and my above criticisms about the execution of the dream sequence, I can at least say that the arc is rarely boring. While it doesn’t exactly improve my opinion of Leonardo, I will admit that the dream sequence and the egotistical conclusions Leo came to were certainly more insight than I had anticipated. I really enjoy most of your reviews on this Blog but i strongly disagree with your assessment on this story. As I didn’t read this story as Leonardo being so arrogant that he feels his family cannot survive without him. I read it as Leonardo struggling with depression of killing an innocent, as well as believing that he would in fact be the reason of his families downfall. ‘Blind Faith’ is an amazing stand alone story. but without the events to flesh out Leonardo’s journey of self discovery, it feels incomplete and under developed. And the final reveal of the ‘deceit’ that started Leonardo’s depression was very clever wring to Jim Lawson’s credit.